At just 18 years of age, Jared Hazen took third at the 2014 Rocky Raccoon 100 Mile in a speedy 13:57:17. 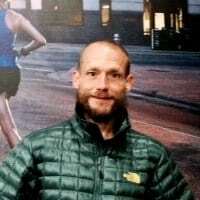 In the following interview, his first with iRunFar, Jared talks about his high-school running history, his previous 100-mile win, his high-mileage training, and whether we can expect to see him claiming his Montrail Ultra Cup entry to the Western States 100.
iRunFar: This is Kim Wrinkle of iRunFar, and I’m with yesterday’s third–place winner, Jared Hazen, 18 year old Jared Hazen. So Jared, tell us about Jared Hazen. Who is this guy that has suddenly burst onto the running scene and has a ticket to the Western States 100? Jared Hazen: Well, I grew up in Titusville, Pennsylvania, and kind of got into ultras just from… I ran cross country and track and started running a lot. I really started loving it. There’s an ultramarathon in Titusville and so I think that probably had a pretty big influence. There’s a pretty good ultra community there. So I really started getting into it and running a lot and signed up for some ultras and definitely a 100 miler was a big goal for me. So that’s what brought me here today. iRunFar: This is your second 100 miler? Hazen: Yes, this is. I ran the Oil Creek 100 in October. iRunFar: And did you place overall in that? Hazen: I won that one. iRunFar: Fantastic, so a first and a third is not a bad way to start off. iRunFar: So Western States is coming up. What is between now and then? Any race plans? Hazen: I’ll probably do a 50 miler between now and then just to kind of test the fitness. Yeah, Western will definitely be a focus and just train really hard between now and then. iRunFar: I was talking about your phenomenal performances and you said, “I run a lot of miles. I run a lot of miles.” Take us through your training. Hazen: Leading up to this race—the two months before the race—I was running anywhere from 150 to 200 miles/week. Just getting out doing really long runs like eight hours back to back or eight and four hours on the weekends and getting out for three to 3.5 hours on the weekdays—just running a bunch. iRunFar: Is this mostly on trails or roads or a combinations? Hazen: Actually for this one because it’s a flat course, I did do a fair amount of bike trail just to get a fast turnover. iRunFar: How did you end up in Colorado? Hazen: I have a friend that lives down there and I was spending my summer up in Wyoming, and it kind of got cold up there and I didn’t want to go home back East, so I moved down there into his apartment and started training down there. iRunFar: Did you run in high school back in Pennsylvania? Hazen: I did. I ran cross country and track and not a huge amount of success. I had a 9:42 PR in the 3200. So it wasn’t anything special. iRunFar: What made you decide to give ultras a shot? Did you do marathons before? Hazen: No, I haven’t actually run a marathon yet. I just like to run a lot and it kind of makes sense to do ultras if you like to run a lot. If you’re doing a 100 miler, you should love it. iRunFar: How did this course compare to Oil Can, your first one? Hazen: This one is much flatter. I think Oil Creek is 18,000 feet of elevation gain. It’s not mountainous, but it’s just kind of up and down all day. This one is definitely flat. It rolls a little, but it’s definitely flat. iRunFar: I’m glad you corrected me—Oil Creek sounds a lot better than Oil Can. It’s more intimidating. So Western States—are you definitely planning to run Western States? Hazen: Oh yeah, yeah, sure. iRunFar: Any goals there? Time goals? Finish place goals? Hazen: I haven’t even thought about it yet. iRunFar: Too soon. How are the legs today? Hazen: They’re sore for sure. iRunFar: Talk about your shoe choices yesterday. Was it one pair the entire way or did you switch off? Hazen: Yeah, it was one pair the entire way. I went with the New Balance MT 110 and they worked great; no problems at all. iRunFar: Interesting thing yesterday, I think it was maybe after the thirdlap and you saw me on the trail and you threw me a Clif Bar and I don’t know if you already had one or you just didn’t need it or what. How were you taking in calories during the race? Hazen: Yeah, I tried to do some Clif Bars earlier in the race just to prevent me from getting hungry, but I definitely like to switch to gels after about half way. When I gave you that Clif Bar, I’d just picked up eight gels and didn’t have any room for that Clif Bar anymore. iRunFar So it was more of a practicality issue. iRunFar: How did you find the humidity? Was it difficult or was it just one of those things you just deal with? You were consistently in the top five the entire race. Hazen: Yeah, I felt warm. It was kind of getting uncomfortable, but I wasn’t cramping. It wasn’t really affecting me. It wasn’t hampering my performance at all. It was just a little uncomfortable. iRunFar: Well, 18 years old, you might want to get used to this interview thing because you might have a few more on your horizon. Good luck at Western States and with all your other races this year. Hazen: Thank you very much. Hell of a race Jared. I was at RR crewing for a couple of friends and every time Jared came in completing another lap he looked like a seasoned vet. I kept thinking at some point he was going to fall of the pace but I'm glad he proved me wrong. Good luck at Western and listen to your body. Don't push too many of those 200 mile weeks! Great to see some new and young talent popping up on the radar! Great interview Jared, and good luck at Western!